Phew! That’s a relief! ‘Greece emerges from Eurozone bailout programme’, the BBC website announces. But it emerges, if that’s the right word, weakened, crippled and hobbled having undergone eight years of punishment beatings by the EU, the European Central Bank and the International Monetary Fund which former finance minister Yanis Varoufakis has described as ‘fiscal waterboarding’. An excellent summer read, worthy of joining the recommendations of colleagues on TCW, is Adults in the Room, Varoufakis’s account of the period around his all-too-brief tenure as finance minister and the man notionally in charge of negotiating with EU institutions and the IMF. Subtitled My Battle with Europe’s Deep Establishment, the book has a particular relevance for anyone following the tortured Brexit negotiations, and it is no coincidence that the term ‘Grexit’ (Greece exiting the Euro) was coined well before ‘Brexit’ entered the language. A problem with the EU project – and I grant you there may be more than one – is the belief that political will can trump economic reality, so the binding together of a ragbag of different economies in a single currency was always inherently unsound. 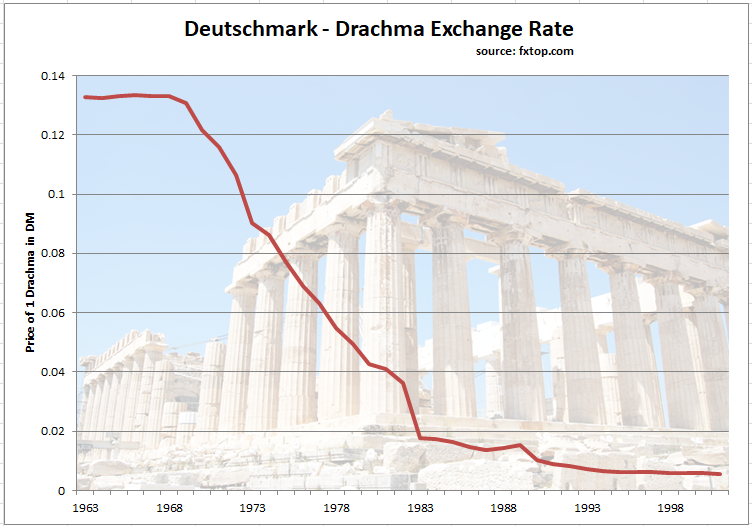 Consider how the Greek drachma was valued against the Deutsche Mark over time and how this reflects the disparity between the two countries’ productivity. 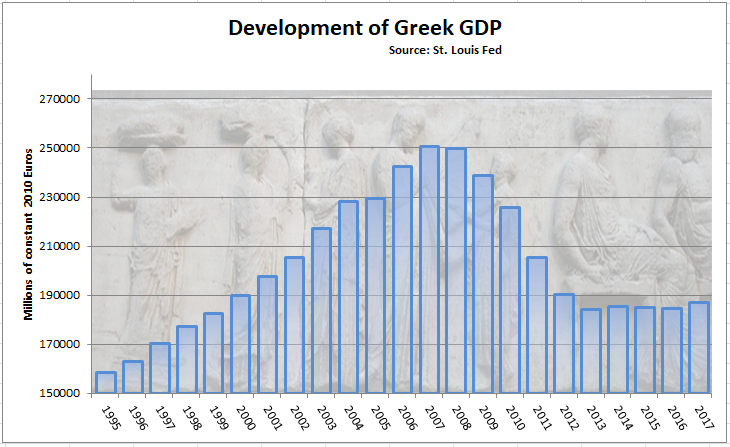 A number of things followed from the creation of the Euro and ultimately they were all damaging to the Greek economy. Imports became relatively cheaper, exports including services such as tourism became relatively more expensive and credit, which had hitherto been restricted in the financial closed system of the drachma, burgeoned. Commercial banks, primarily from Germany and France, took on heavy exposures to the Greek state, relying on the not always reliable principle that sovereign countries don’t go bust, particularly when notionally underpinned by the ECB. In January 2015 the new radical Left Syriza government of Alexis Tsipras, which Varoufakis was to join, might have changed the destiny of both Greece and the Eurozone. By the summer it was clear that Greece would be unable to meet its immediate repayment commitments and a Third Economic Adjustment Programme was drawn up which ratcheted up still further the austerity measures to be imposed on the country in conjunction with a fresh bailout. The terms had the effect of making an already uncompetitive economy yet more uncompetitive by, for instance, hiking the rate of VAT on tourism hotels. The crazy assumption by the experts regularly flying into Athens was that demand was perfectly inelastic so an increase in the rate of VAT would result in an equal increase in government revenues because consumers would buy the same amount irrespective of price. This package was strong meat for a radical Left party which had come to power on an anti-austerity programme, and so a referendum was held to obtain consent from the people. It’s a sobering thought that if the accepted wisdom (and I absolutely don’t accept it) is that folk who vote against the good things that Brussels offers are irredeemably stupid, then the Greeks are considerably thicker than the British because 61 per cent of them rejected the proposed package. 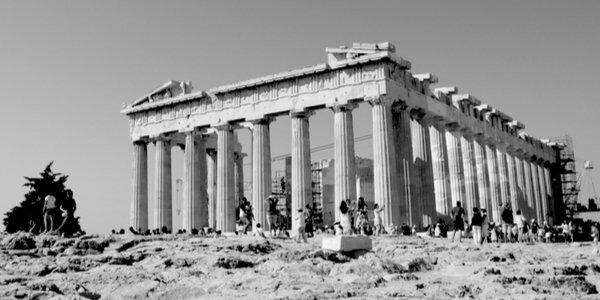 In the wake of the international financial crisis of 2008, the Greek economy began shrinking from its 2007 high of €250billion and Greece received its first austerity package early in 2010. Given the stifling impact on economic activity caused by the EU’s special measures, perhaps the people were wiser than their prime minister who was persuaded by the Athens equivalent of Remainers in thrall to all things EU – as well as by the Brussels nomenklatura – to fire Varoufakis. Tsipras was ultimately owned by the EU and if there is any similarity with Theresa May, well this is how the EU deals with its wayward children. Another similarity, coincidentally, was that Tsipras, like May, negotiated with the EU behind the back of the responsible minister. What was abandoned was Varoufakis’s perfectly sound strategy whereby Greece would have defaulted on a small loan repayment which would have triggered a plethora of cross default arrangements threatening the vulnerable German and French banks as well as the entire Euro architecture. Varoufakis was gambling on a certainty: a small default would not immediately unleash Armageddon (defaults can morph into delays that can be tidied up after the event) and a package of debt forgiveness and a sensible rescheduling of the residual debt could be hammered out to allow Greece sufficient space to recover. The stakes were very high. Any element of debt forgiveness might well have overstretched the commercial banks’ capital adequacy so the UK experience with RBS and Lloyds TSB would have been mirrored on a grand scale in the Eurozone. The flaw in Varoufakis’s thinking at the time was the belief that Greece could remain in the Euro when the sensible course would have been to leave a currency union which Greece should never have joined. A report in last Monday’s Times suggested that Yanis Varoufakis has now changed his mind. 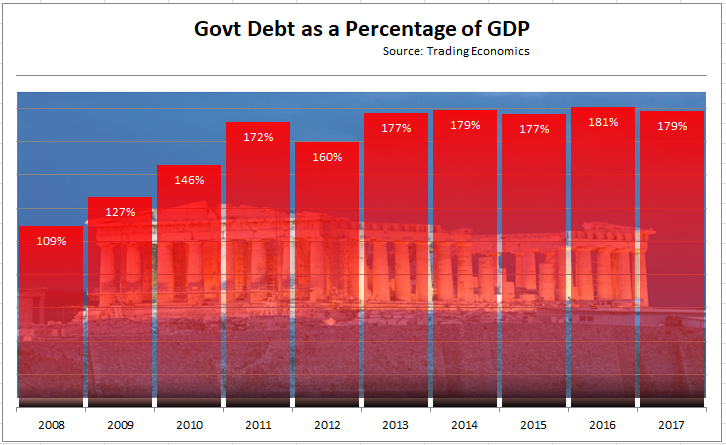 Given that successive austerity packages aimed to reduce Greek government debt, how well has this worked out? Not terribly well. 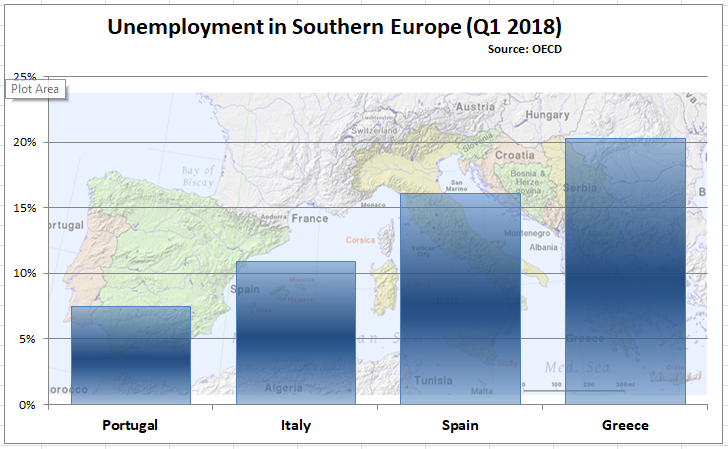 Continuing austerity measures mean that a shrinking economy slimmed down to where it was almost twenty years ago yields ever smaller revenues and the debt ratio remains obstinately constant, while unemployment at around 20 per cent remains the highest among the EU’s largest southern countries. How have the media been reporting the ‘end’ of the Eurozone bailout programme? There is a distinction between those who prefer to see, hear and speak no evil when it comes to the EU and those who are clearer-sighted. The Daily Mail’s coverage stands out in this respect, for example here and here. The BBC obviously tries valiantly to make a good news story over the unmitigated disaster that is Greece today and produces some illusory rays of sunshine. ‘For the first time in eight years, Greece can borrow at market rates,’ we read on the website, but what the interest rates are and who the lenders might be is obscure. The EU Commissioner with notional responsibility for Economic and Financial Affairs, Pierre Moscovici, is quoted saying predictable things that mean nothing but conceding that recovery is ‘not an event, it is a process’, which is EU code for ‘Greece will never crawl out from under the stone that EU intransigence has placed there’. Remarkably, a fabulous IMF statistic makes it on to the BBC site: only four countries have shrunk economically more than Greece in the past decade: Yemen, Libya, Venezuela and Equatorial Guinea. You needn’t feel guilty if events in Equatorial Guinea have failed to register but the goings-on in the other three countries are well known to all. What war, lawlessness dictatorship and socialist policies have done to those benighted countries, the EU with a walk-on part for the IMF has done for Greece. On this the BBC is silent. Alexis Tsipras has marked the occasion this week with cheap symbolism by following in the footsteps of Odysseus and visiting Ithaca. The original Odysseus, after twenty years away from home – so legend has it – was at first recognised only by his dog! That’s a good age for a dog and it would only take three generations of that breed to see modern Greece returned to economic health. If Mr Tsipras has a dog, would it recognise the radical anti-austerity campaigner of 2015 in the EU stooge posing for the cameras this week?